My friend Kat entered her dog, Mr. Kimble, into Modern Dog Magazine’s Cover Dog Contest. 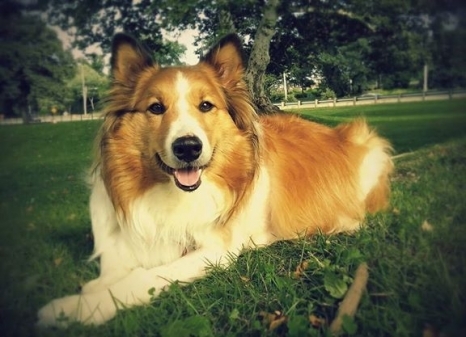 Mr. Kimble is a Shetland Sheepdog and very special. In July 2014 he was in a bad accident, and needed expensive surgery. With the help of an entire community, the funds were raised for him to have the operation and he’s now recovered. The photo was taken about 6 weeks after the surgery and was one of the first times the dog smiled since the accident. The winner of the contest will be decided by whichever dog receives the most votes, and first prize is a photo shoot with the dog appearing on the Spring 2015 cover of the magazine. All of the dogs entered have a chance to be featured in the magazine, too. You can vote for Mr. Kimble once a day until January 7, 2015 at 12 p.m. PST, by clicking this link. As a fellow dog lover, I’ve had the pleasure of meeting this little guy in person, and he’s a sweetie. If any dog deserves to win, it’s him!